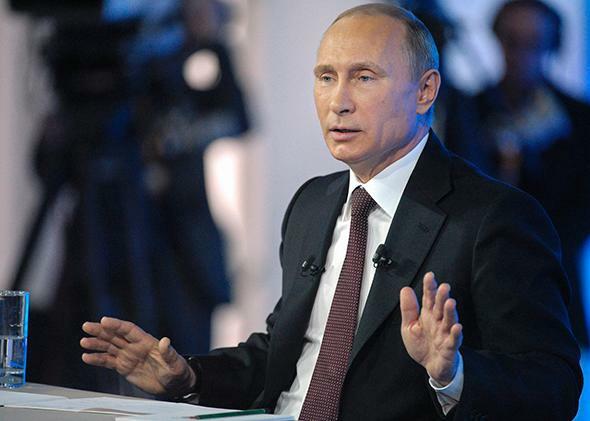 Vladimir Putin’s annual televised question and answer: The Russian president’s cynical politics on Ukraine. The Russian president’s cynical politics make for frightening television. Russian President Vladimir Putin takes part in a live nationwide phone-in in Moscow on April 17, 2014, directly contradicting statements he made in the recent past. KIEV, Ukraine—Vladimir Putin finally admitted that Russian soldiers were involved in the amputation of Crimea from Ukraine last month. Asked during his annual televised call-in show about the “little green men”—as the masked, heavily armed men were known by locals—Putin hardly blinked. “Of course” Russian servicemen stood behind the ragtag Crimean self-defense units, Putin replied. Never mind that just a little more than a month ago, he had flatly denied the involvement of Russian troops on the Crimean Peninsula—or any intention to annex it. The Russian president doesn’t care what his opponents at home and abroad think of him. He sees the struggle for Ukraine as the battle for his own political survival, which gives him the strength to forge ahead. If the Kremlin can’t control all of Ukraine anymore, it will do everything it can to turn the country’s political and economic life upside-down. Perhaps even a few more Ukrainian territories will fall off in the process. One of the state television presenters hosting the four-hour Putin extravaganza set the mood by saying “genocide” was taking place in eastern Ukraine, where the interim national government is struggling to dislodge pro-Russia demonstrators from seized police stations and other administrative buildings. The well-armed fighters in camouflage uniforms who appeared last weekend are reminiscent of the little green men in Crimea and seem to indicate an escalation by Russia. “Hogwash,” Putin said today about the possibility of Russian meddling. It was an eerily familiar denial. The new Kiev authorities are threatening their own people with tanks and warplanes, Putin claimed, reversing the cause and effect of the timid security operation in eastern Ukraine. If anything, the provisional government could be accused of doing next to nothing to reassure Russian speakers in the east—who largely supported ousted president Viktor Yanukovych—of their place in post-revolutionary Ukraine. Once pro-Russia demonstrators started wielding guns, the Kiev government was faced with the Catch-22 of provoking a full-scale Russian invasion by using force or allowing pro-Russia separatists to run amok. A vaguely worded agreement to end the violence, signed by Ukraine, Russia, the United States, and the European Union in Geneva, hadn’t been reached while Putin was still talking. But he made the Kremlin’s position perfectly clear about Russian speakers in eastern and southern Ukraine: “We must help these people defend their rights and decide their future on their own.” Putin said he “very much hope[s]” he won’t have to send troops into Ukraine after getting permission to do so from Russia’s upper house of parliament in March. The choreographed Q&A marathon portrayed Putin as the master of the situation, reeling off facts and figures, never losing his cool, and even having a laugh at the expense of his ex-wife, Lyudmila. Putin, in his 15th year in power, is a ruler in love with himself. He’s ready to pull out all the stops for Ukraine—and he knows that the West can’t match his determination. There were plenty of barbs for the Obama administration, the biggest of which came in the form of a phone call from Edward Snowden, the former spy who leaked information about the National Security Agency’s massive surveillance programs before seeking refuge in Russia. Snowden asked—in English—whether Russia spies on its own citizens the way the NSA does. Putin replied that Russian security services don’t engage in mass eavesdropping because they are “under strict control,” and anything else would be against the law. Putin even pretended to listen to his critics, some of whom were sitting in the studio audience, and a panel of concerned international experts posing questions via a satellite linkup from Berlin. As with Russia’s staged presidential elections, everything was set up to make Putin appear reasonable and moderate—somewhere between Kremlin propaganda boss Dmitry Kiselyov, who foamed at the mouth about the “cancerous growth” called NATO, and Irina Khakamada, a forgotten liberal politician from the 1990s. The most pointed questions came from residents of Russia’s far-flung regions. One pensioner asked Putin if the national budget wouldn’t be hurt by Western sanctions on Russian oil and gas exports. He replied confidently that Saudi Arabia is the only country that could make up the difference and it wouldn’t risk a falling oil price by ramping up production. As for gas, Europe is far too dependent on Gazprom’s pipelines to be able to make any serious reductions, Putin gloated. In reality, Putin isn’t in as advantageous a position as he suggests. The Kremlin can write off Ukraine as a friendly state for years to come, leaving Russia with a shrinking circle of reluctant post-Soviet allies consisting of Belarus, Armenia, and Kazakhstan. In the wider world, Russia is also isolated: It can only count on occasional Chinese backing in the U.N. Security Council and the moral support of Venezuela, Zimbabwe, or Cuba when the going gets tough. While the first half of Putin’s call-in show was devoted to events in Ukraine, the first grumblings of dissatisfaction could be heard when questions turned to domestic issues: rising utility bills, miserly state salaries and pensions, the lack of roads. Ordinary Russians will be struggling to make ends meet no matter how much of Ukraine Putin manages to bite off.